The Walking Dead “Stradivarius” was written by Vivian Tse and was directed by Abraham himself – Michael Cudlitz. This is Cudlitz’s directorial debut, and he delivers a solid episode. He’s helped by outstanding performances from Norman Reedus (Daryl) and Melissa McBride (Carol). The episode starts to give us an indication of the characters who are going to play a more central role now. The scene in which the importance of the arts to humanity is explained by Luke is also a terrific centerpiece. 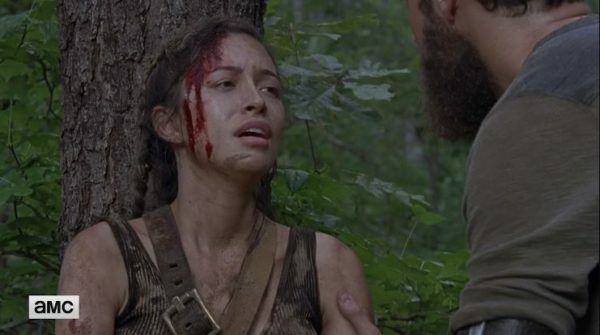 The episode begins with some terrific handheld camera stuff as Rosita (Christian Serratos) staggers through the woods – alone – surrounded by whispering until she finally collapses. There’s no explanation as to what happened to Eugene (Josh McDermitt) or who ultimately rescued Rosita. 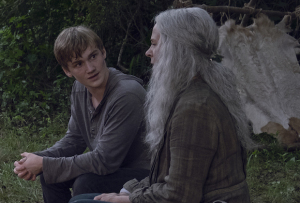 In one of the major story threads, Carol and Henry (Matt Lintz) stop in with Daryl. It’s clear that Carol has been a regular visitor as she comments that he hasn’t fixed the boat since last time. 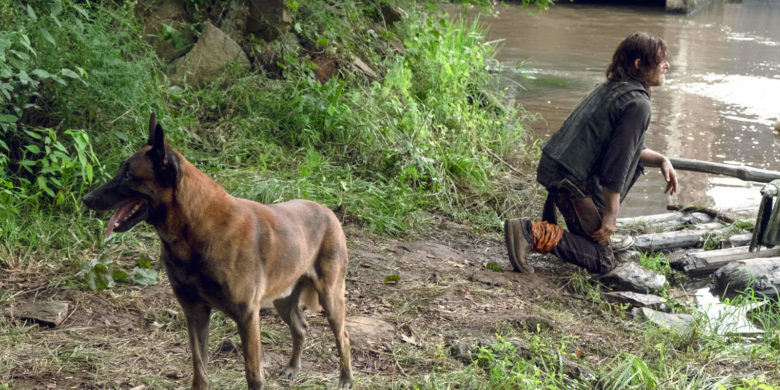 Daryl hasn’t been completely alone – he has a dog – Dog – now! He also has his camp surrounded by traps. Dog keeps bringing in walker body parts. Carol is clearly concerned about Daryl and asks him when he last ate. He deflects her question by saying the dog ate yesterday. 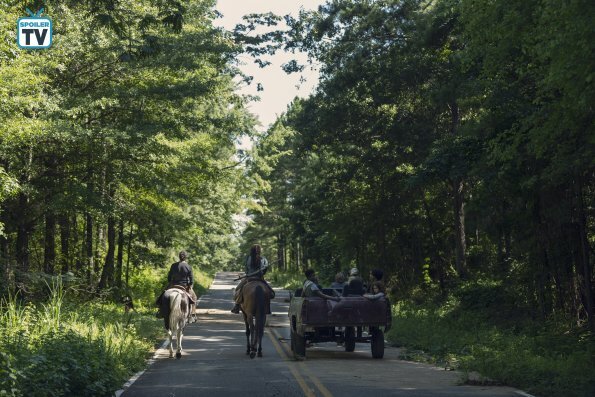 In the other major story thread, Michonne (Danai Gurira) escorts the newcomers to Hilltop. They are taking them to their rig first to get their belongings though. Michonne tells Siddiq (Ari Nash) to just say what he wants to – it’s clear to her that he has something to say. He admits that he’s glad she changed her mind about the newcomers, but she knows he’d rather she’d let them stay in Alexandria. Siddiq knows she likes them – but Michonne says she that may be, but she doesn’t trust them. 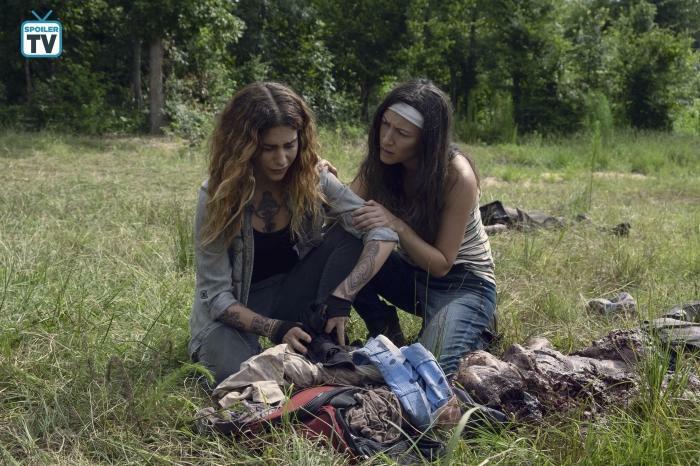 The newcomers talk amongst themselves – Magna (Nadia Hilker) is still belligerent and wants her weapons. Luke (Dan Folger) is happy to have found some relative security. Kelly (Angel Theory) is clearly thinking they’ll just go their own way once they’ve picked up their stuff. They are hardly criminal masterminds as DJ (Matt Mangum), who is driving, gives them an incredulous look. Michonne overhears too. 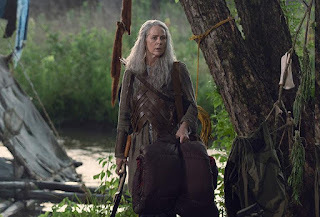 Yumiko (Eleanor Matsuura) apologizes to Michonne for Magna, explaining that she’s been on edge since they lost Bernie – who clearly meant a lot to Magna. 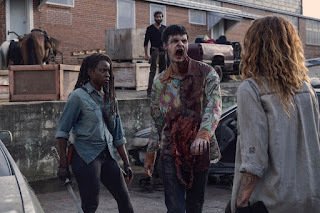 Yumiko tells them about the horrid shirt that Bernie used to wear to get under Magna’s skin – so you knew that we were going to see a walker later wearing the shirt. Yumiko wants to know about Hilltop. Michonne admits that she hasn’t been there in a while, but she promised her daughter she’d get them there. And then we’re off to Hilltop. It is still the thriving community it was when we saw it last. Tara (Alanna Masterson) has clearly taken on a position of responsibility, and we see her checking in with various people – Enid (Katelyn Nacon) running the clinic/hospital and Dianne (Kerry Cahill) who seems to be in charge of the crops. Is anyone else curious as to why Dianne has never returned to the Kingdom? I get that she was loyal to Maggie (Lauren Cohen) – but we learn immediately that Maggie has indeed gone off to work with Georgie. And a quick note here that while I get not wanting to dilute Andrew Lincoln’s departure, the way the show treated Lauren Cohen’s departure was really quite disgusting. She delivered a brilliant performance in the last episode to be sure, but didn’t she deserve a bit more of a send off?? I loved Carol watching Daryl. I didn’t love him shooting and decapitating a snake to wear though. Carol points out that Daryl has been out there longer then he said he’d be, but he likes it because it’s quiet. Daryl asks after the King, and Carol tells him that Ezekiel (Khary Peyton) is having trouble letting go – she’s taking Henry to apprentice at the Smithy. Daryl tells her that he appreciates her visit – she seems really good – he’s clearly still keeping an eye on her too. But he also knows that there’s another motive to her visit. 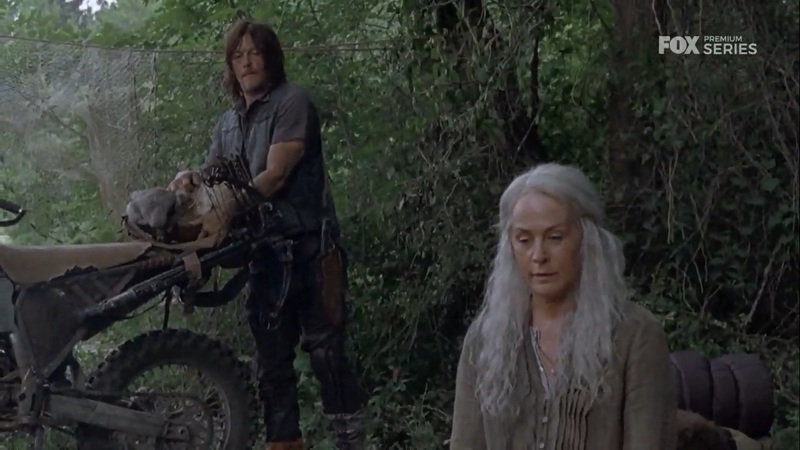 Carol asks Daryl to come with them. She can’t stay – there’s too much to do at the Kingdom. She wants Daryl to keep an eye on Henry because he’s an idealist like Ezekiel – and Daryl is pragmatic like she is. Daryl tells her that he’s just going to have to learn – like everybody else did. Like they did. Meanwhile, the newcomers arrive back at where they were found. It’s interesting that we get yet another word for walkers. They call them “sickos.” They are dismayed at how much damage the herd did. The newcomers prove that they have survived for a reason as we see them not hesitate to take care of the walkers left. Michonne watches. Magna is clearly upset as he goes through Bernie’s things – is she looking for that paisley shirt? Shouldn’t she remember that he was wearing it? Yumiko tells her to take something to remember him by. Siddiq finds a recorder – among Luke’s other musical instruments. 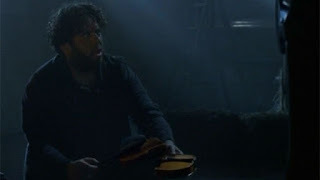 He tells Michonne that it was the first instrument he played as a kid. His Aunt got it for him as a kid and he had it for a week before his mother decided he liked painting better! It’s a nice little tie-in to the kazoo story. 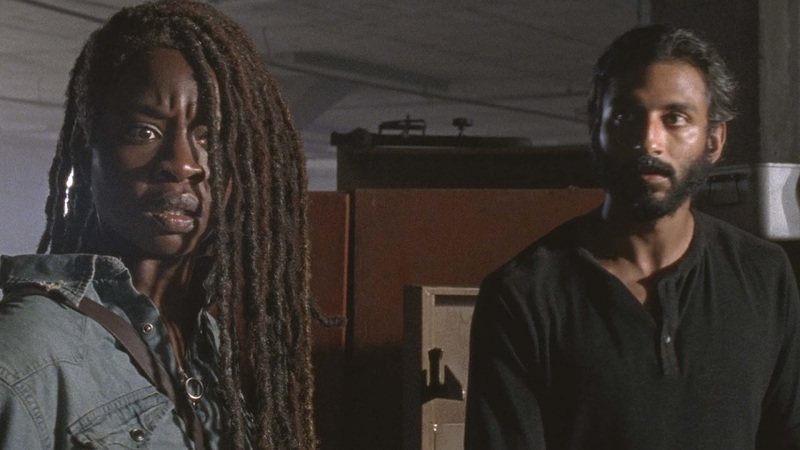 Michonne stops Siddiq from playing it – for her own sanity. Luke is distraught – he’s looking for the Stradivarius of the title, of course. Connie (Lauren Ridloff) tells Siddiq that Luke has a fetish – and Siddiq is happy to learn the sign for fetish! Michonne tells DJ to collect all their weapons. Magna is not happy. 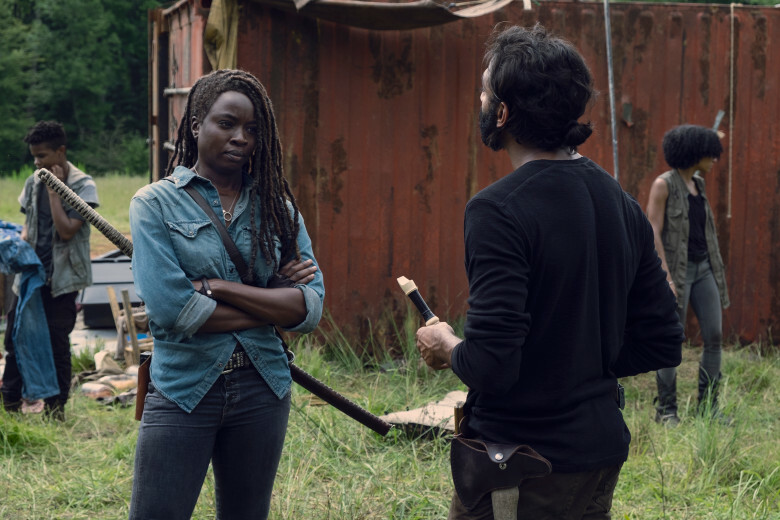 Michonne states she’s not letting her men take 5 armed strangers into Hilltop – and then Yumiko isn’t happy that Michonne isn’t coming with them. Michonne says she only came to make sure that their story checked out. 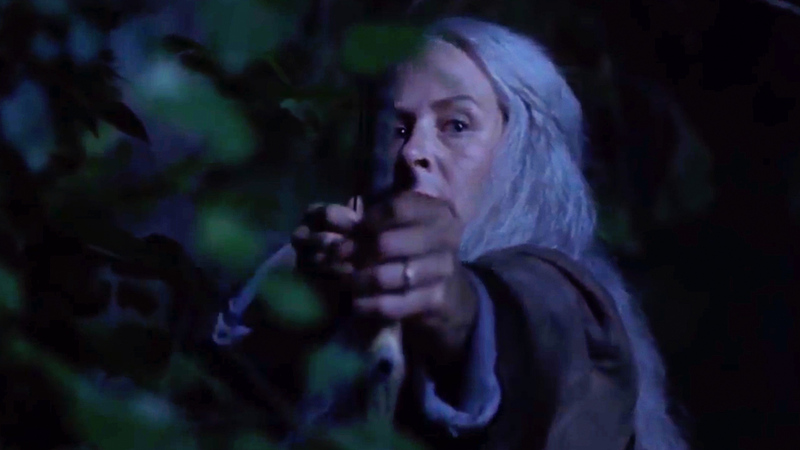 Michonne gives them a choice – take their weapons and go or give up their weapons and try for something better. Yumiko is clearly the leader and convinces the others to accept Michonne’s rules – at least for now. 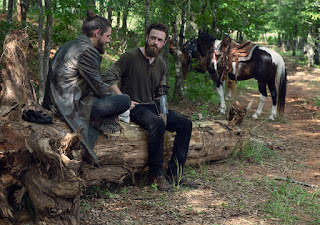 One of my favorite scenes is when Aaron (Ross Marquand) literally comes out of nowhere and takes Jesus off his horse! The two proceed to have an awesome sparring session. Jesus has clearly been training Aaron. Afterwards the two share some water and catch up on the news. Aaron congratulates him on winning the election. 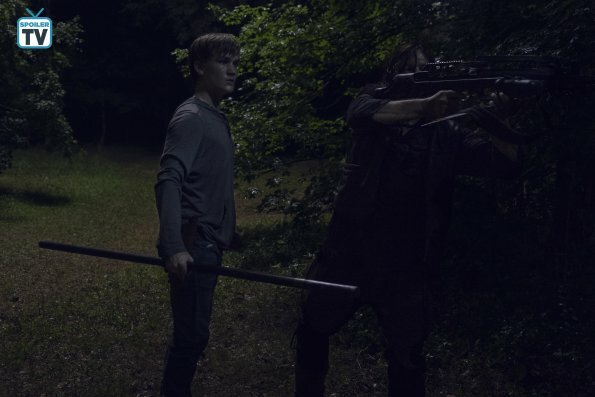 Both are “violating protocol” – Tara would be furious with Jesus and Michonne with Aaron. Once again the subject of the Fair comes up. Michonne is dead set against letting Alexandria participate. Jesus emphasizes the Fair’s importance to bring the communities back together. We learn that Michonne doesn’t even know about Maggie – so she’s clearly been keeping Alexandria completely separate from the Hilltop – blaming them for Rick’s death? We’ve heard so much about this Fair that it would seem to be an inevitable event, bringing together all the communities – to be attacked in one place? Clearly, others have been keeping the lines of communication open. 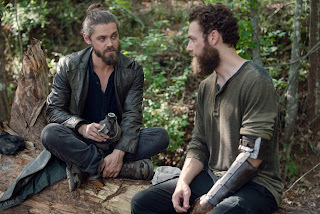 Aaron and Jesus are interrupted by a flare going up and find Rosita hurt and alone. Aaron immediately asks where Eugene is because he saw them ride out together. She tells them she left him at “the barn.” Jesus tells Aaron that they have to go – it’s going to be dark soon and there’s a herd descending upon them. They’ll (and us!!!) just have to hope Eugene will be ok for the night. Daryl cooks dinner – hopefully rabbit stew/soup and not rattlesnake! Dog brings back part of a foot and I loved the look on Henry’s face as he asks if the dog always does that. Daryl says he’s got his reasons and lobs it on the fire! 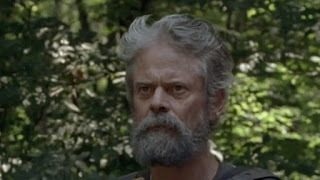 Henry is not stupid, and quickly asks if they’ve come to bring Daryl as his chaperone at Hilltop. Henry insists that he can handle himself – but it’s clear that Carol isn’t just worried about Henry. She’s putting Daryl with him for a reason. The scene with Carol cutting Daryl’s hair is terrific – even if it doesn’t really look to make much of a difference. Daryl tells her that he’s not still looking for Rick – but he never did find a body… ever. And I loved that Daryl gets the “no body, not dead” rule of fiction! He also confides that after a while it was just easier to stay out on his own. I love the chemistry and friendship between these two characters. Daryl is able to be vulnerable with Carol as he can’t be with anyone else. 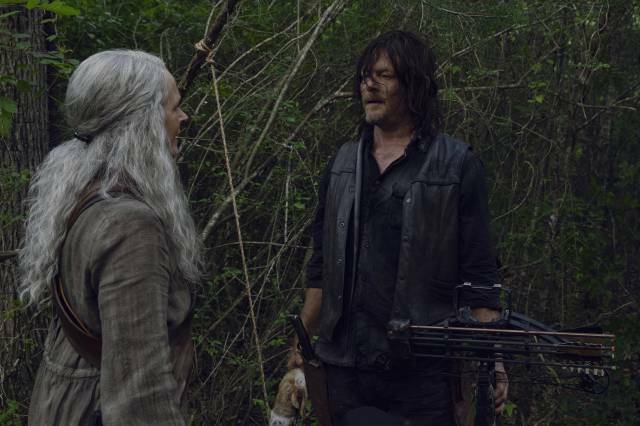 Carol says “that’s better” – ostensibly referring to the haircut but really referring to Daryl’s opening up to her and confirming that he’s really ok.
Over dinner, Carol smiles at dinner, but Henry continues to study Daryl. He asks how Daryl got the scar – and honestly, I had to rewind to the haircut scene to even see it because of how Reedus keeps his hair! Daryl doesn’t answer but gets up to feed Dog his dinner. Carol sees Daryl shut off and looks unhappy and Henry just looks frustrated. Back with the newcomers, Michonne is standing guard when she hears a noise. She creeps back in to the building they are holed up in and sees Luke bending over holding something. She tells him to drop it and turn around. When he won’t drop it, she slashes it as he turns around. It’s a great fake out when he screams – but all she’s killed is his Stradivarius. When Daryl leaves camp, Henry follows him. Daryl saves him from a walker and tells him to go back, which of course Henry doesn’t do in grand Carl style. They hear Dog barking and he’s gotten himself trapped in a walker trap that Daryl has set up. Daryl leaving walker corpses and having walker traps – and even leaving walkers who are trapped alive almost seems like the Sanctuary wall of walkers – and remember from the first episode that Daryl wouldn’t let them use walkers as scarecrows. It’s hard to tell if this is a step forward or a step backwards for Daryl. 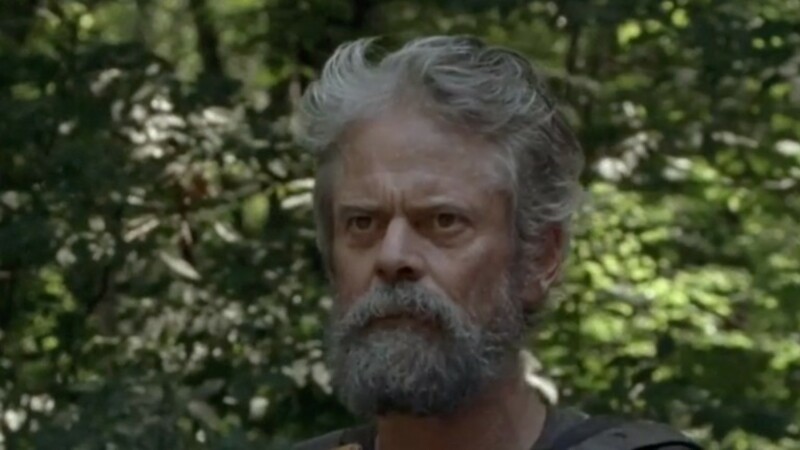 It did seem a bit ridiculous that Daryl has lived out there on his own for so long and it’s only the night that Henry and Carol are there that he comes so close to getting bit that Henry has to save him. I did worry that Daryl had kept that snake head to use the venom on the spikes in the traps and that when Henry got scratched he was going to get very sick or die – but apparently it really was just a scratch. The thing I really did love about the scene is the shot of Carol right at the end with an arrow notched and ready to fire if her boys ran into trouble. I’m sure that I wasn’t the only one wondering how everyone could leave camp without Carol noticing. Clearly, she’s hoping the two will bond. Back at Hilltop, Jesus checks in with Tara about Rosita’s condition. She’s still unconscious, but just dehydrated so she’ll make a full recovery. Tara remarks that it was weird to see Rosita and Aaron after so much time. Jesus confesses that he’s been training Aaron and keeping the lines of communication open. Tara thinks that Jesus is just trying to avoid his responsibilities at Hilltop. Tara agrees that the Fair is important, but the people of Hilltop want – and need – their leader to be there for them. Jesus says maybe they shouldn’t have voted for him – he’s clearly not happy being leader. Tara tells him to quit pretending it’s temporary. Everyone needs him – and btw? She’s going out to look for Eugene in the morning, but Jesus needs to stay there. 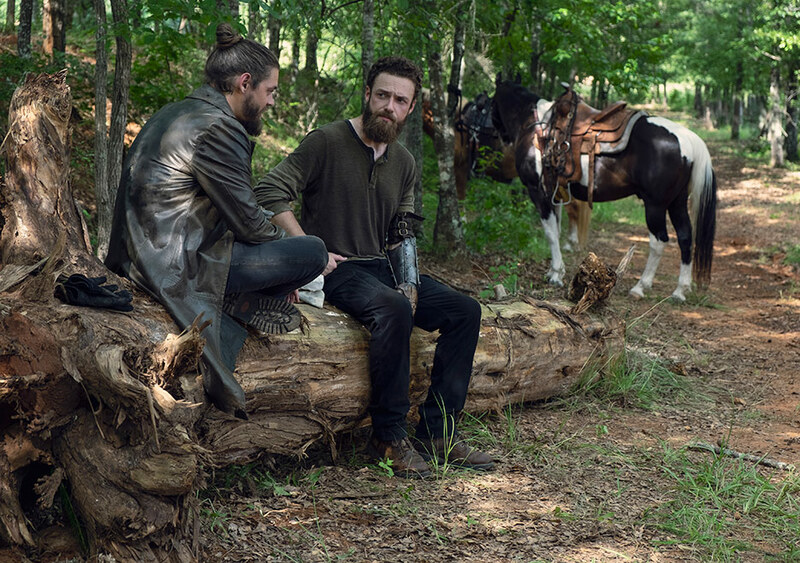 Back at Daryl’s, Henry watches closely as Daryl changes his shirt – we see the scars on his back, which can mostly attribute to what happened to him as a child and with the Saviors – but he also has exactly the same X on his back that we saw on Michonne’s last week. What does that mean and how does that relate to the scar on his face? Henry is reading by the fire, and Daryl brings him an ointment to put on his leg to keep it from getting infected and joins him by the fire. 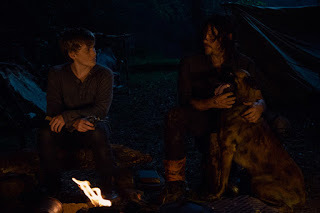 Daryl tells him that Dog checks the traps and lets him know if he has a walker problem – that would be his reasons for bringing the body parts back. And of course, this is the first time Dog got stuck in one of the traps. Daryl thanks Henry, and Henry thanks him, especially for not telling Mom. Daryl remarks that the traps are no way to die – slow and painful. He’s just trying to keep the walkers out. Henry once again barrels in where polite conversation would keep most people out. 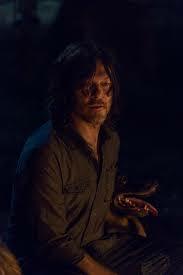 He tells Daryl that Carol says that Daryl is her best friend – and that she misses him and worries about him. Daryl tells him she knows where he is and how to find him – and Henry shoots back that she shouldn’t have to! Daryl looks a little chastened and asks if that’s what Henry wants – Daryl looking over his shoulder all the time. Henry tells him that it’s not just about him. We know that Henry doesn’t want Daryl looking over his shoulder, but he also knows that Carol wants to know that Daryl is safe – and if he isn’t, Carol will continue to put herself in danger to check on Daryl – clearly, she’s been making the journey alone up until now. And of course, in the end, they both make the “sacrifice” for Carol. 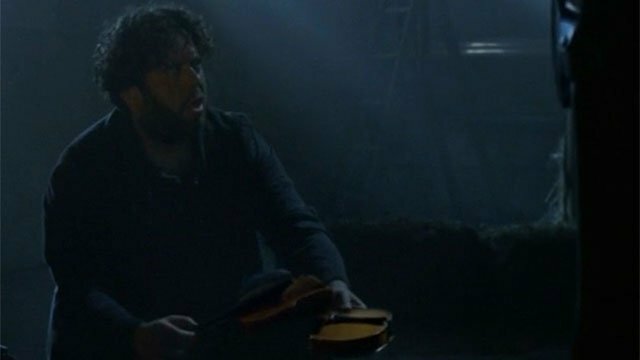 Luke is distraught over the destruction of the original Stradivarius – circa 1725. It seems clear in this scene that Yumiko and Magna are in a relationship – nicely subtle up until here. Siddiq is intrigued that Luke has been traveling with this collection of musical instruments – that he’s been adding to as the group traveled. The irony of his fixation on music while traveling with deaf people is not lost on me – but it’s also a metaphor for the relationship of art to the walkers. Luke replies, “It’s art!” It’s all the explanation he needs – and Yumiko’s “here we go” clearly shows that it’s something he’s explained before. He gives them a history lesson on how ancient humans defeated the Neanderthals. Archeologists found a 40,000 year old flute in a cave – just like Siddiq’s recorder – and let’s not forget that his mother turned him to painting – something also found on cave walls – and another art. Luke tells them that ancient humans came together around a fire – like at Daryl’s camp – they created a common identity, built communities, and grew and as they grew Neanderthals retreated and eventually died out. Like it or not, art is the one thing that separates us from the animals. For better or worse, it brings us together – and if they are trying to rebuild something, they can’t ignore that. Yes. The symbolism is a bit heavy handed – but the parallels to the walkers are unmistakable and even Michonne starts to pay attention. It’s also clear that she may start to see the importance of the Fair now too. Michonne asks Luke after all that he’s seen and done, does he still believe that? And Luke hasn’t lost hope. He tells her yes. It’s what makes them stronger – sharing – survival of the fittest. And Michonne has no argument for him. This is one of my favorite scenes from the entire series! 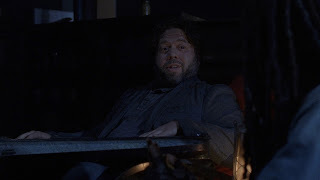 And it definitely makes Dan Fogler – Luke one of my favorite characters. 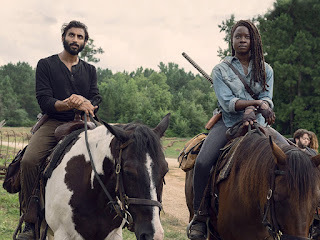 The next morning as they pack up, Michonne tells Siddiq to take supplies with them. Siddiq tries again to get Michonne to come to Hilltop – he’s clearly part of the communication network. He tells her that it’s the least she can do to make up for killing Luke’s violin. When that doesn’t work, he tells her that Maggie isn’t there and Jesus is running Hilltop. Before she can get an answer about where Maggie is, they are overrun by walkers. Yumiko pleads with Michonne to give them their weapons. When Michonne still won’t, Magna picks up a brick to defend them. Finally, when they are clearly being overrun, Michonne tells DJ to give them their weapons. We get to see Kelly’s prowess with a slingshot – which is a pretty cool new weapon! Luke uses his head to block walkers with a car door, and Yumiko makes a great shot with her bow to take down a shed. 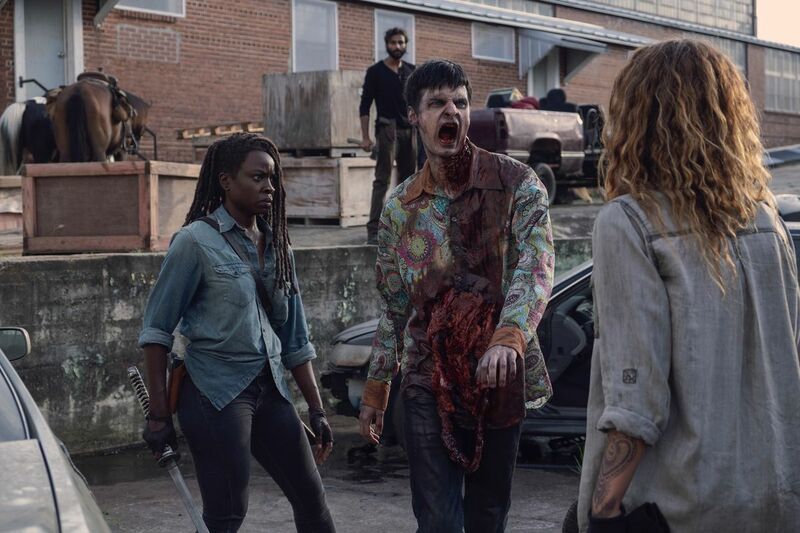 Michonne says it’s the same herd that destroyed their rig – because she’s spotted Bernie – in his telltale paisley shirt. Magna is clearly overwhelmed and she can’t kill him. It’s a new side to her that Michonne hasn’t seen. She comes up behind Bernie and slides the blade into his brain gently so as to kill him, but not let Magna see the blade. When Carol gets up the next morning, Daryl is packing his motorcycle. Henry limps by, and she doesn’t ask why. Daryl asks how she slept, and she says good – like she didn’t see everything! And she asks how he slept – “good. Real good.” – cuz he wasn’t up most of the night with Henry… They’re too adorable. Carol just smiles when he says he’ll be ready to go in about 10 minutes. 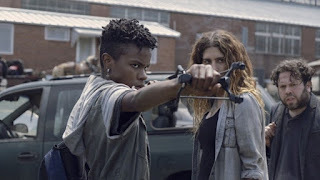 As the newcomers continue their journey, Michonne tells Yumiko she knows what it’s like to have to carry the burden of responsibility for your family. 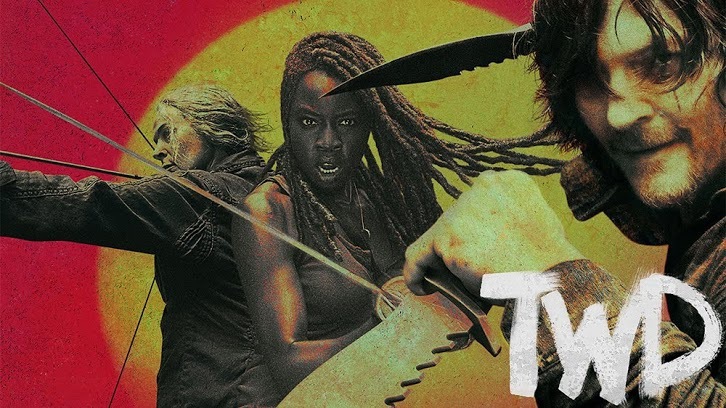 Yumiko says they’ll be ok – and Michonne finishes because you have to be. Michonne is ready to leave them. Siddiq finally tells Michonne that Maggie is with Georgie – far away – helping with a new community. 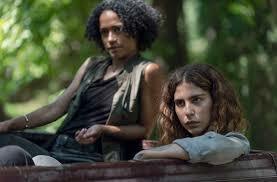 Siddiq points out that she can come to Hilltop now, but she insists that she’s kept her promise to Judith. Siddiq brings up her promise to Carl – finally! – and Michonne insists it’s not that simple. The two are interrupted by riders from Hilltop, including a character played by C Thomas Howell. 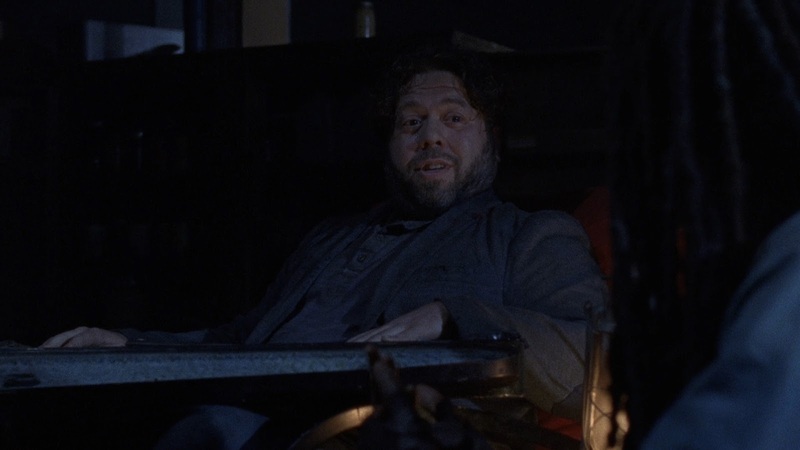 Apparently, Howell did the cameo as a favor to his good friend Michael Cudlitz! He tells them about Rosita. Michonne asks them to take a message to Alexandria – that Michonne and the others are headed to Hilltop and are safe. Connie thinks she sees something in the woods, but ultimately says it’s nothing. And then we get a great shot from the vantage of something or someone watching them from the woods. At Hilltop, Carol, Henry, and Daryl arrive. Henry wonders if Selena is still there and will recognize him – he’s bigger and taller now… potential girlfriend? Is this a bigger draw than apprenticing maybe? Carol thinks he’s adorable – and he denies it. Tara is clearly thrilled to see Daryl and the two fist bump before hugging it out. As much as I prefer our people together, reunions are always fun too. Jesus greets them too. Aaron and Daryl hug. Aaron tells them about Rosita and that Eugene is missing. They need a good tracker – and Daryl checks with Carol first before saying yes. Henry wants to go, and Carol shuts that down. Jesus insists on going to, so Tara agrees to stay behing – but the next kazoo complaint is on him! The episode ends with a great crane shot of Jesus, Aaron, Daryl and Dog going out for Eugene. We also get another great shot of how much Hilltop has grown. This episode was a lot about “getting there.” However, we get great scenes with Daryl, Carol, and Henry, and some much needed backstory is filled in – though there are still a lot of questions – like what happened between Michonne and Maggie? How did Michonne and Daryl get those scars? Are Aaron and Jesus a couple? But I loved Luke’s lecture on the importance of the arts – remember Michonne helping Judith paint? And the handprints that Carl left with Judith? What did you think of the episode? Was this an acceptable farewell for Maggie - Lauren Cohen? Let me know your thoughts in the comments below!